I love my strawberry huller. It is great for removing the green tops from strawberries without having to waste a lot of the small berry. It’s also great for removing the eyes from fresh pineapples. If you don’t have one, you should think about getting one. How many of you are guilty of letting vegetables go past their prime? 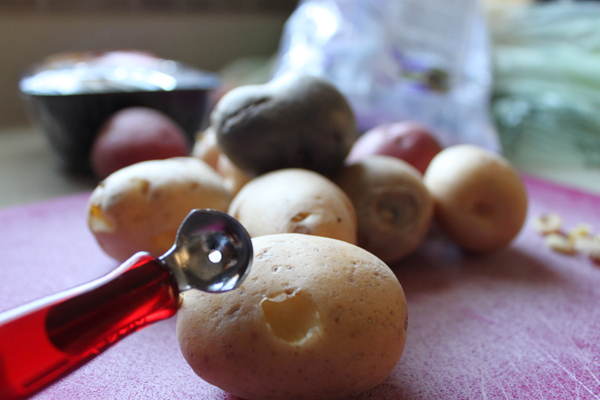 I had planned to make roasted chicken with root vegetables for dinner tonight (more on that tomorrow) and discovered that my potatoes had “eyed-over”. Pineapples eyes are just like potato eyes, right? Comment love: Do you use a strawberry huller? Do you have any other uses for it? I was first introduced to these delicious crunchy cookies on Delta Airlines. I became to like them so much, that I would often beg ask the flight attendants for extra. My world changed when I discovered that Wegman’s was carrying them and I no longer had to buy a $500 plane ticket to devour enjoy these yummy cookies. Just when I thought life couldn’t get any better, one day while at Wal-Mart, there is was…Biscoff spread in “smooth” AND “crunchy”….wait for it…with a $1.00 off coupon. I could’ve died and gone to heaven. I snatched up those glass jars like I was a contestant on Supermarket Sweep. 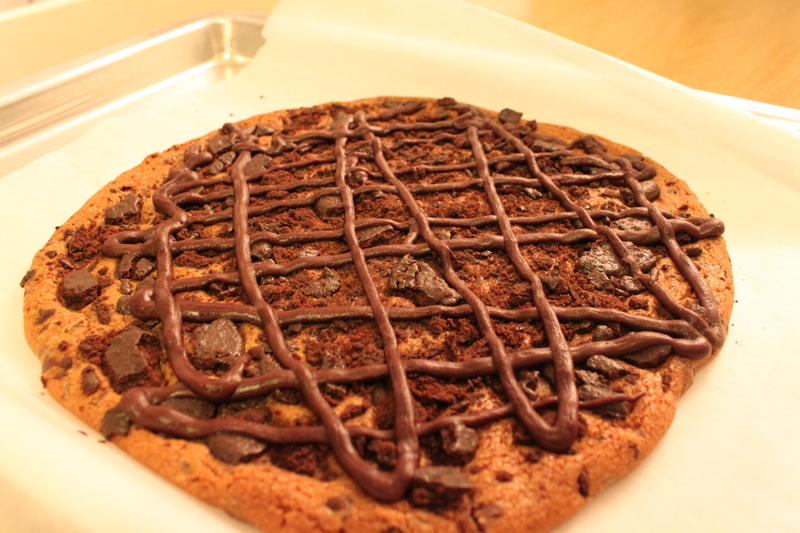 Since Biscoff Cookies and Spread went mainstream, life has been a little sweeter around here. I have to admit, even though I’ve seen dozens of ice cream, muffin and bar recipes incorporating Biscoff, I’ve been more of a purist, using only the spread (on toast, apples, in banana milkshakes) or just eating the cookies. After hoarding Biscoff recipes on Pinterest, I finally decided to bite the bullet and bake with Biscoff. This recipe is a simple recipe that makes a sweet, dense bread, similar to a coffee cake. Preheat oven to 325°. 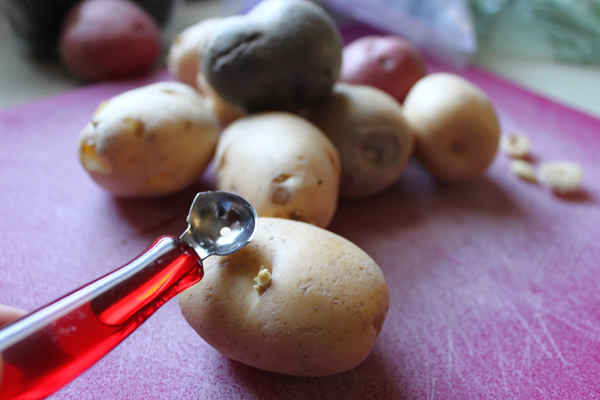 Spray mini-loaf pans with cooking spray. Using an electric mixer on medium speed, beat butter and sugar until light and fluffy. Add eggs and vanilla. Mix well. 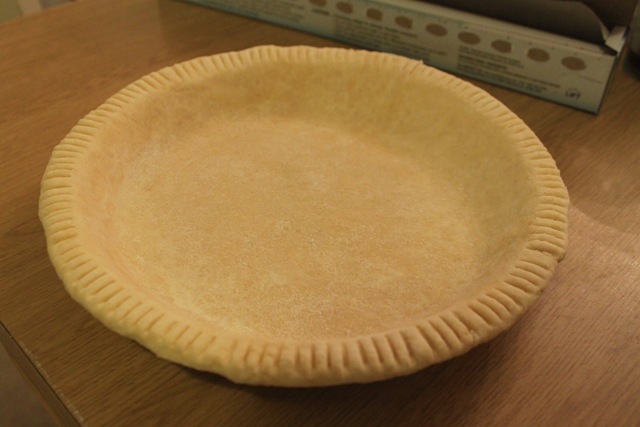 Gradually add in flour, baking powder and salt. 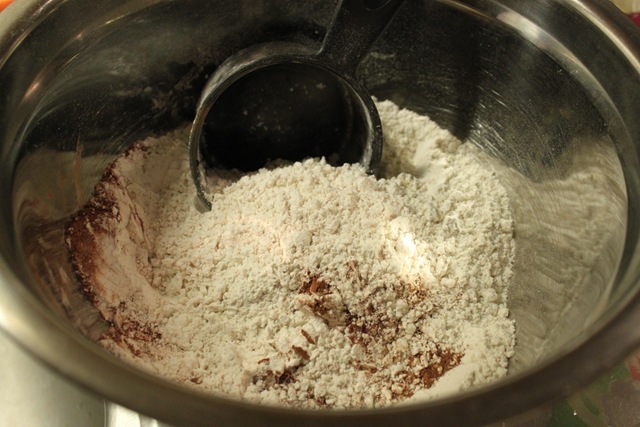 Gradually add flour mixture. Mix just until combined. 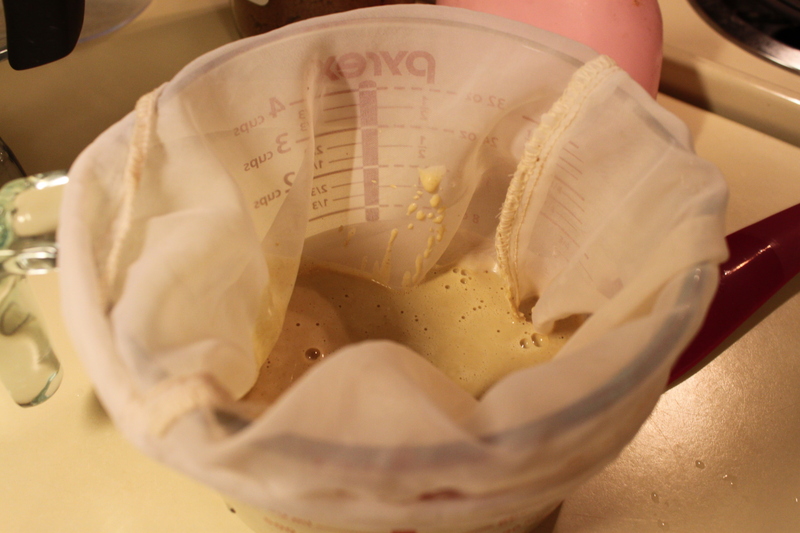 Add in crushed Biscoff cookies to the batter and mix until combined. Divide batter between the 2 mini-loaf pans. Place about 2 T Biscoff spread on top of each loaf. 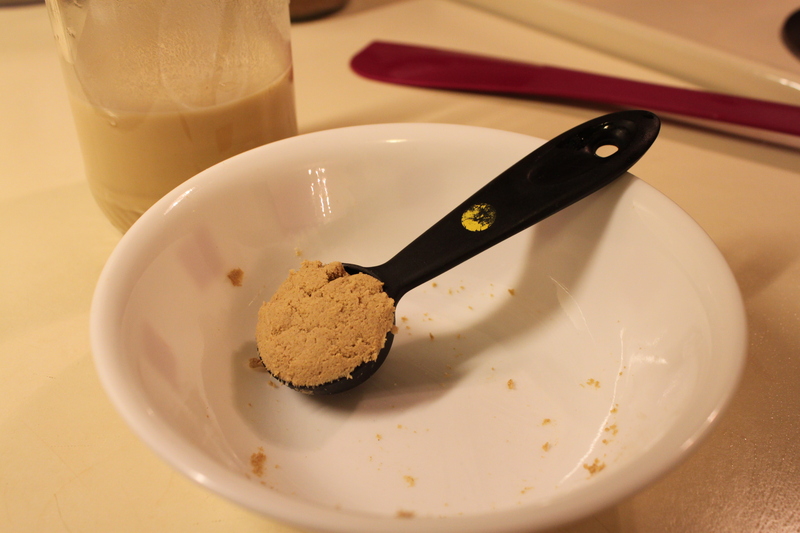 Swirl Biscoff into batter using a butter knife. Top loaves with more crushed Biscoff cookies. 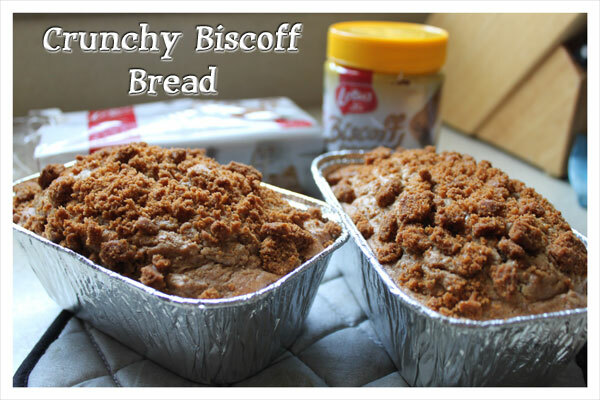 How have you been enjoying Biscoff cookies and spread? Do you like it crunchy or do you like it smooth? 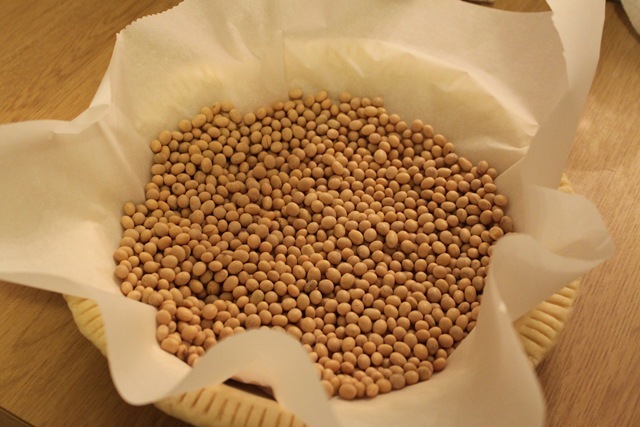 Any Biscoff recipes you’ve been dying to try? Love Thin Mints? Then, you’ll love this even better. Lately, I’ve been reading Facebook status updates from my girlfriends who are practically cursing the Thin Mints Girl Scout cookies. I, too used to have a love/hate relationship with Girl Scout cookies. Love to eat them. Hate yourself after you’ve eaten the whole box in one sitting. Thin. Mints. Are. Addicting. Then, I found this recipe from Rachel Ray years ago. I’m happy to share this recipe with you as a solution to your Thin Mint addiction. 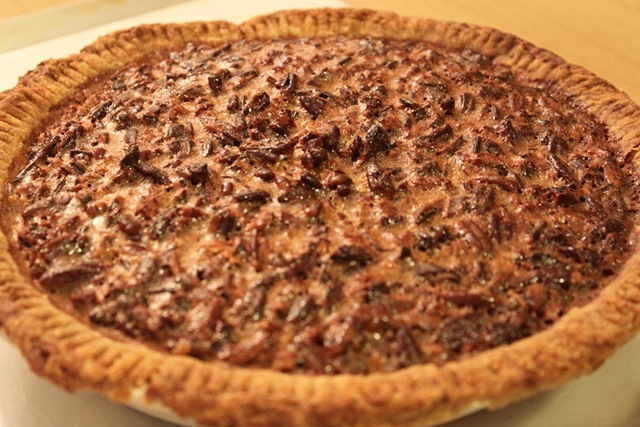 Well… come to think of it– I’m not sure if you thank me or curse me (because this recipe is delish). So, every year when cookie sales come around, I buy a box of Thin Mints, eat half and save the other half to make this Thin Mints Dessert Pizza. Make it and take it to work. You will definitely win “Co-worker of the Week” for sharing this with them (and you’ll have only devoured half the box by yourself instead of the entire thing). Yeah, this title might totally be the way R would describe some of my past baking (and cooking) “experiments”. Remember that cake-in-a-jar that I baked back in October 2010? Well, immediately after making them, I sent them off to my sister and BIL who are currently serving in A-stan. All except for one lonely jar. I stuck this one away at the bottom of my fruit basket with all intentions of “opening” it about 3 weeks after I baked it. (Three weeks is about the time that it takes for a package to arrive over to my sister.) Well, about three weeks later, I did indeed hear from her that the pineapple cake-in-a-jar was delish and she then requested zucchini bread-in-a-jar, which you can read all about here. Needless to say, I forgot about the cake-in-a-jar that I had saved to try later. One month passed. Then two months. For the last couple of weeks, I’ve been eyeing the jar on my baker’s rack and every time I see it, I decide that I’m going to open it…and then I get distracted and forget about it. I think part of me was (subconsciously) afraid it wasn’t good anymore and I would get some sort of stomach bug from it. And that’s coming from the girl with the iron stomach. Well, I saw an “encouragement” from my friend A (see her blog here) to “write” blog entries so she would have something to read tonight, so A, this post is for you. 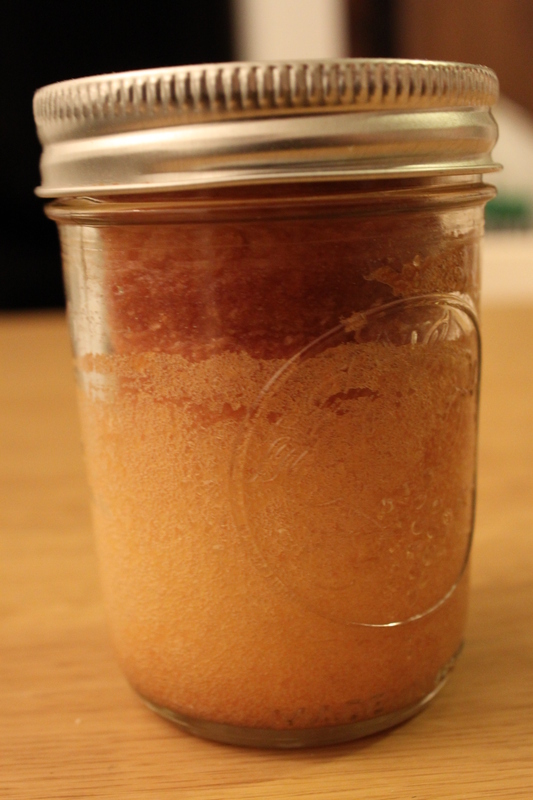 Here’s what the cake-in-a-jar looked like after 3 months. No obvious mold. Good. If they sell donut holes, where do all the bagel holes go? 1) Sometimes things really do taste better homemade. 2) Sometimes things really are cheaper homemade. 3) It’s “greener”. 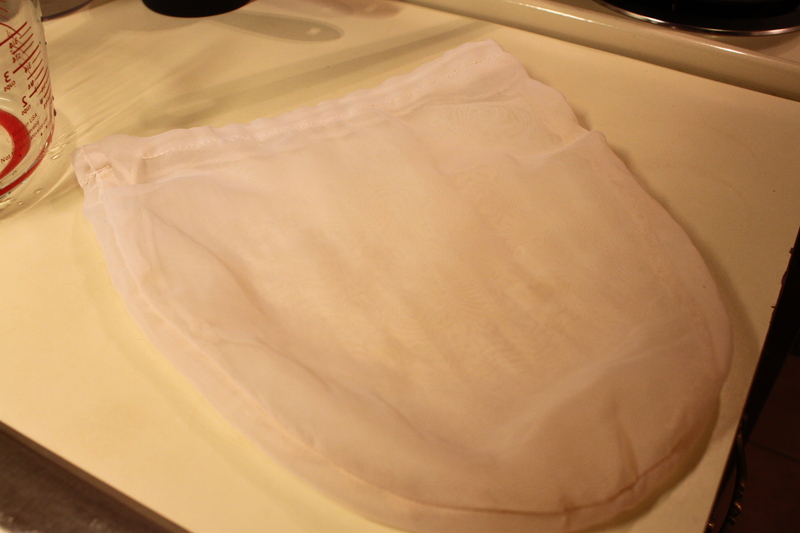 It reduces packaging waste and doesn’t contribute (much) to my carbon footprint. 4) I can control what goes into what I make. I don’t need to add preservatives, unecessary colorings or flavor enhancers. 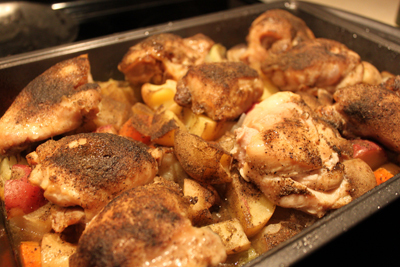 Making food from scratch doesn’t always make sense. Some recipes take way too long to prepare and only taste slightly better than store-bought like my Taiwanese pineapple cakes. But nonetheless it’s fun. This year R and I decided that we weren’t going to celebrate our birthdays and anniversary with gifts in order to save money (and plus neither of us really need/want anything). So, we promised each other we wouldn’t buy anything. Well, giving gifts must be a love language for me. I just couldn’t resist doing something for R’s birthday. Each year, the tradition so far has been to cook him a special birthday dinner. It’s usually lamb because he really loves it and it’s something that we don’t make on a regular basis. But in the last couple of months (ever since returning from our summer trip to Taiwan), I can’t tell you how many times he has mentioned xiao long bao. If you’ve never heard of these or eaten these, they are the most delicious dumpling you will ever have. What makes them extra special is that there is a gushing of delicious, savory soup inside each dumpling that escapes and dribbles down your chin as you bite into its tender, slightly chewy skin. If you ever go to Taiwan (or are in a restaurant that serves these), this is a must-eat kinda food. So, in my quest to become a good Taiwanese wife, I decided to attempt to make these and enlisted my roommate (a wonderful cook) to help. Attempting the make these is definitely not for the faint of heart. They take a lot more effort than the usual speedy Taiwanese recipes that we make on a day-to-day basis. Since the first time that I made these about 3 weeks ago, I have made them twice since and found that each time it does get easier. For me, part of the idea of living fully is to live simply. And in trying to embrace living simply, I’ve been practicing how to become more self-sufficient…which in the kitchen translates into learning how to make as many things as possible from scratch instead of buying it already pre-made. Living simply in the kitchen also means trying to get away with as few speciality appliances as absolutely necessary (e.g., the ice cream maker). I no longer have a need for Coldstone Creamery in my life anymore. For any of you birthday cake ice cream addicts like me, you may want to read on. I love ice cream with stuff in it: brownies, cookie dough, cookies, pie crust, candy, etc. My all-time favorite is birthday cake ice cream. R knows this weakness of mine and will regularly take me to get the “massage ice cream” (aka Coldstone Creamery). For any of you not familiar with Coldstone, it is an ice cream chain that puts a couple of scoops of ice cream on an ice cold piece of marble and “massages” the topping of your choice in with metal paddles. This “massaging” in of your topping ensures that through the last bite you still have topping to eat not like the places where they just put the topping on top so your just left with plain ice cream at the bottom. I usually go in to Coldstone wanting to get something new, but always end up getting the delicious birthday cake ice cream with yellow cake mixed in. It is great because you really get to have your cake (and ice cream) and eat it too. Anyways, it is a sad day for Coldstone as they have lost me as a customer because I now can make birthday cake ice cream at home! I was inspired to try to make this by my friend, J, who recently made it in her Vitamix. 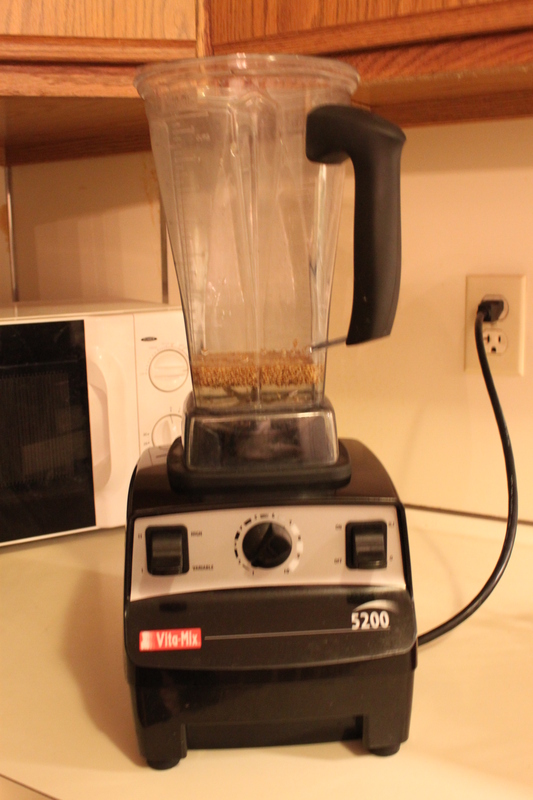 I unfortunately did not make this in the Vitamix, so those of you without a VM can try this too. Oh, and it doesn’t require an ice cream maker either because I discovered this summer that you definitely don’t need an ice cream maker to make delicious homemade ice cream. Who says Mason jars are just for jelly? How to make cake-in-a-jar. Since my sister and BIL left for duty in Afghanistan in March of this year, I have been experimenting with how to best send them baked goods. I had some success in the past with vacuum sealing using a Reynolds vacuum sealer, until the last time I sent her peanut butter bread. When she called me last month, she said she opened up the package and it smelt so good. She was all ready to take a big bite…until she saw the mold. Boo. Determined to send her something besides cookies, I have had this cake-in-a-jar project on my list for a while and just hadn’t gotten around to it until this weekend. For my first attempt, I made a very simple cake. Once I hear from her that it worked, I will fancy it up. 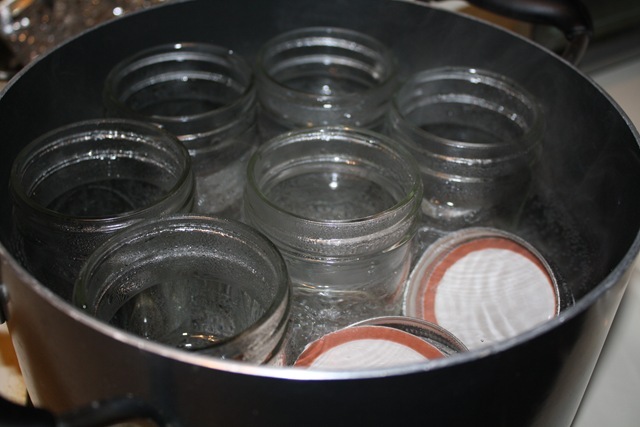 I boiled a big pot of water to sterilize my half-pint jars, lids and rings. You can also use pint jars, which will just result in a bigger cake serving per jar. 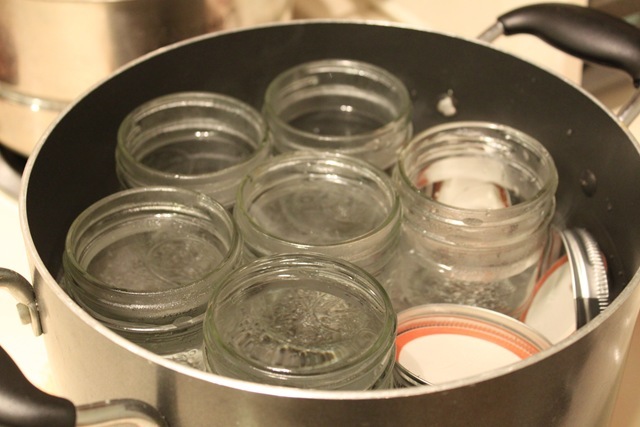 It’s okay to use cleaned old jars. Just make sure to use new lids and rings. 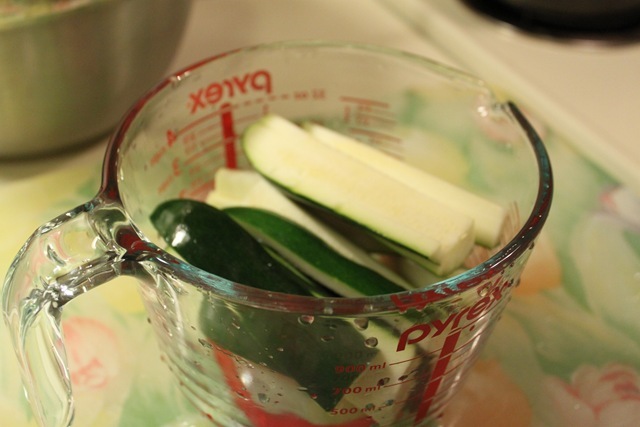 Here is a post on what you can do with all of those zucchinis from this summer’s garden. When I was at the farmer’s market buying peaches and basil for the smoothie that I wanted to try, I also picked up some beautiful zucchinis. 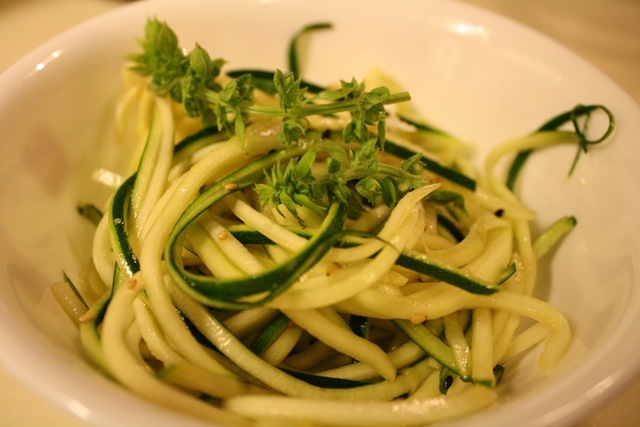 I wanted to try to make the zoodles that I had tried at the local raw/vegan cafe that I ate at the other day. This is perfect for people who are following diet restrictions (for whatever reason), like vegan or raw food diets and for people who just want a fun way to eat zucchini besides zucchini bread. For this re-creation, I did not see what ingredients they used to make them with and just went with my instincts on what I thought I might like. I hope the owner of this cafe isn’t offended by my attempts at re-creating her delicious dishes. I hope she just remembers that imitation is the sincerest form of flattery. 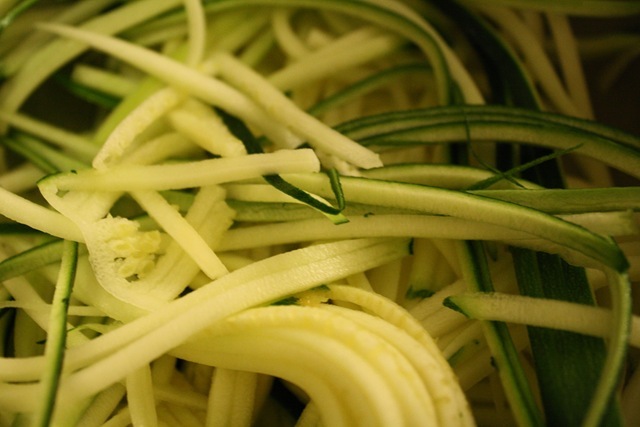 Here is what the zucchini looks like after it’s been attacked by the julienne peeler. Don’t they look like green noodles? Here was my first attempt at Taiwanese Beef Noodle soup. Recipe courtesy of R.
First, I pan fried all the seasonings. Then, added in the beef shank from our local butcher. Here is the finished product. I served it for lunch on Sunday (Taiwanese Father’s Day) for R and I and J and M (Taiwanese restaurant owners). I ate mine with egg noodles (the yellow colored ones) and everyone else had the white noodles. 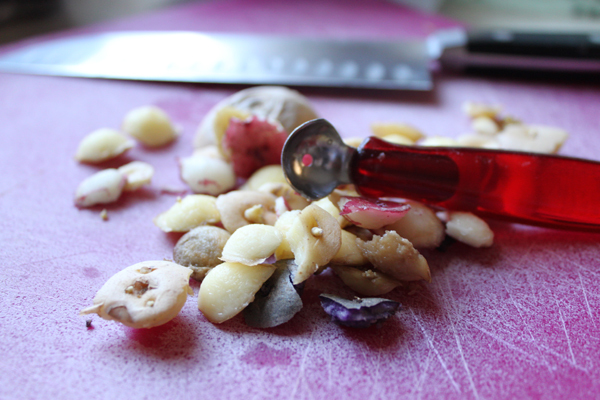 The kick from the peppercorns and dried chilis was delightful. Noone died, so I give myself an A-. cut shank meat. cook in boiling water for about 3-5 minutes. add meat to seasoning mixture. cook all on high heat until meat almost cooked (~5-7 minutes). put meat and mixture into big pot with water and cook on high heat. 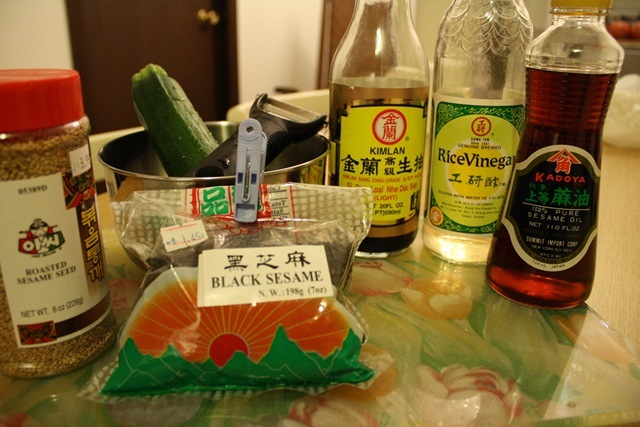 add 1 Corell-sized bowl of soy sauce and 1/2 the amount of rice wine. skim off the yucky stuff as it cooks. after soup boils, reduce heat to low-ish and continue to simmer for about 1 to 1.5 hours, or until meat is super tender. taste broth before serving with noodles. 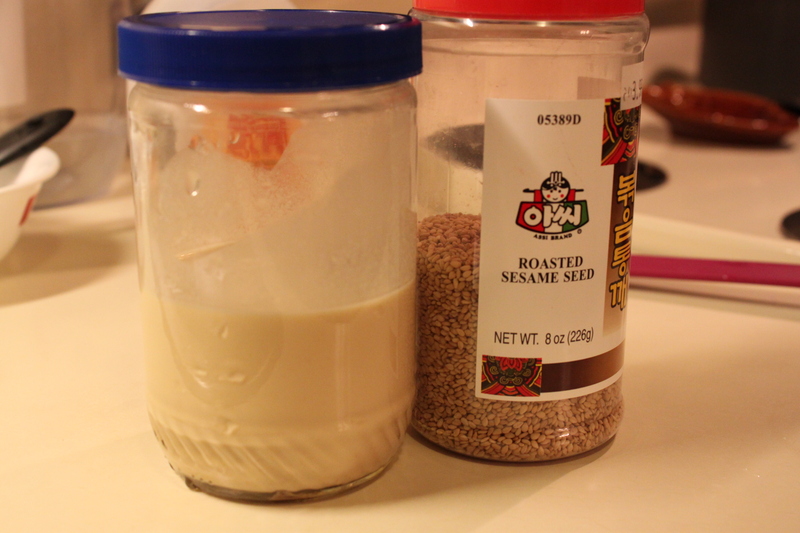 if not salty enough, can add salt or soy sauce. serve with preserved mustard greens and/or hot peppers/relish. notes: added scallions (chopped up with knife) on top of noodle soup as garnish, but didn’t really like “raw” taste of scallions with this soup. next time will probably follow recipe and cook scallions. 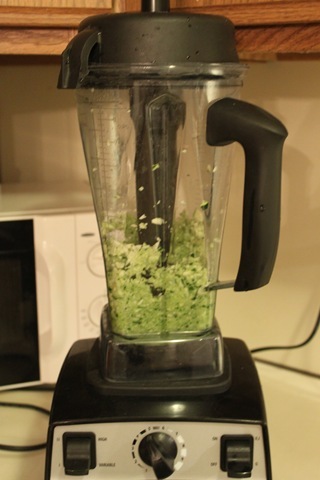 may add very small amount of really finely chopped green onions as garnish (b/c it is very pretty). 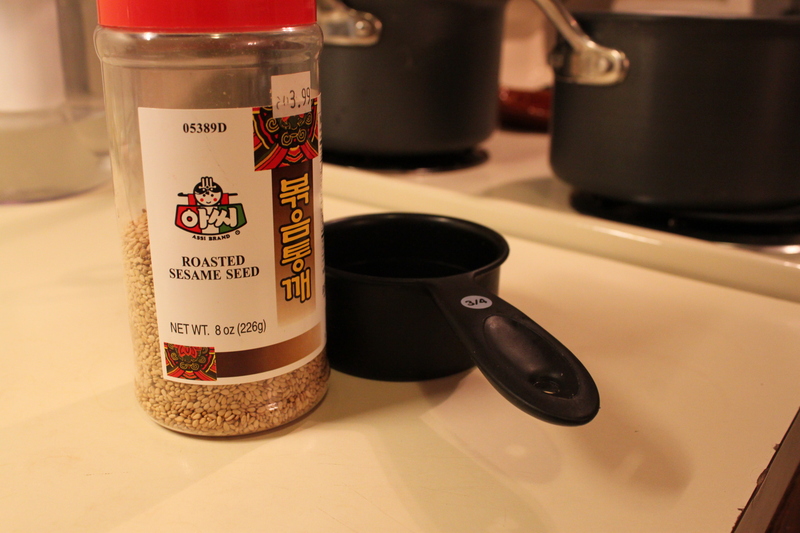 seasonings and amounts listed make a mild to medium hot broth. may want to decrease chilies and/or peppercorns (ma la) for guests who don’t eat spicy food. made enough for 4 generous bowls, plus leftovers for 3 more servings. Tonight I attempted to make Taiwanese Tai Yang Bing.